As the official disc of the World Canine Disc Championship Series, Hyperflite dog discs are truly technology in motion. 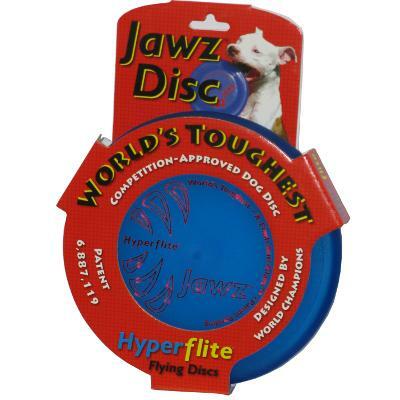 The Hyperflite Jawz Disc is a professional quality disc that may achieve excellent distances, while being extremely durable. Made with modern polymers molded into an advanced aerodynamic form, Hyperflite discs will help you bring out the athlete in your dog! Hyperflite discs are not chew toys. Translucent blue disc with red lettering (color of lettering may differ from what is shown); disc is 8-inches across and weighs a mere 143 grams (5-oz.)! X-Flash anti-glare technology is incorporated into each Jawz disc, for enhanced visibility. Competition approved.